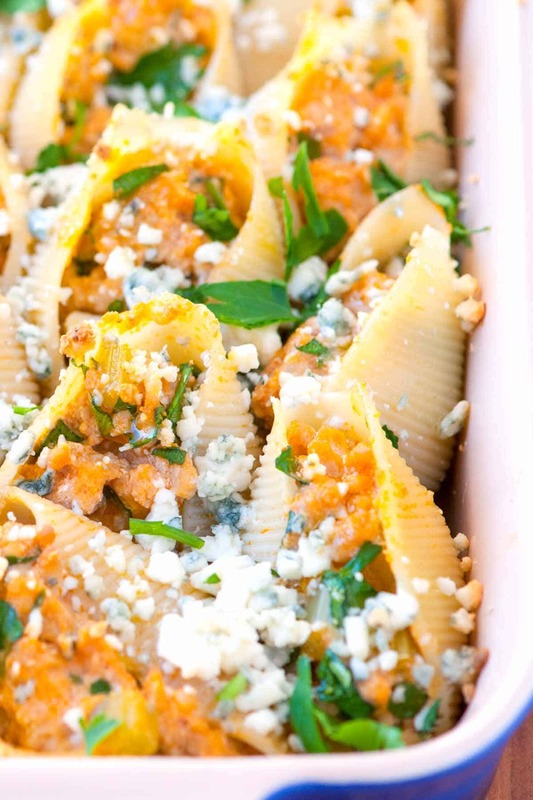 How to make buffalo chicken stuffed shells with ground chicken, ricotta, and blue cheese. 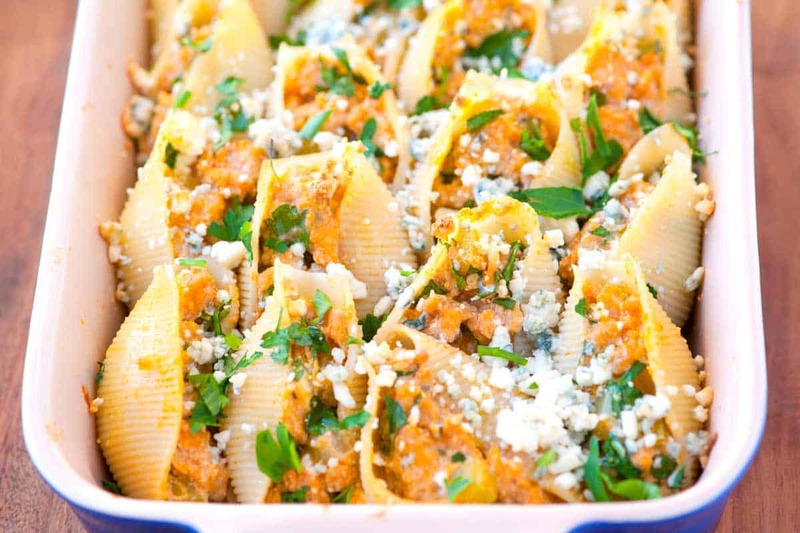 Jump to the Buffalo Chicken Stuffed Shells Recipe or read on to see our tips for making them. We couldn’t help ourselves. After Taco Stuffed Shells and Sausage and Spinach Stuffed Shells, we were craving another version. Since Adam has been contriving various ways to make hot wings again, he suggested that all those flavors go into their own shell. YOU MAY ALSO LIKE: You will love this easy buffalo chicken pizza with shredded chicken tossed in buffalo wing sauce and cheddar cheese. 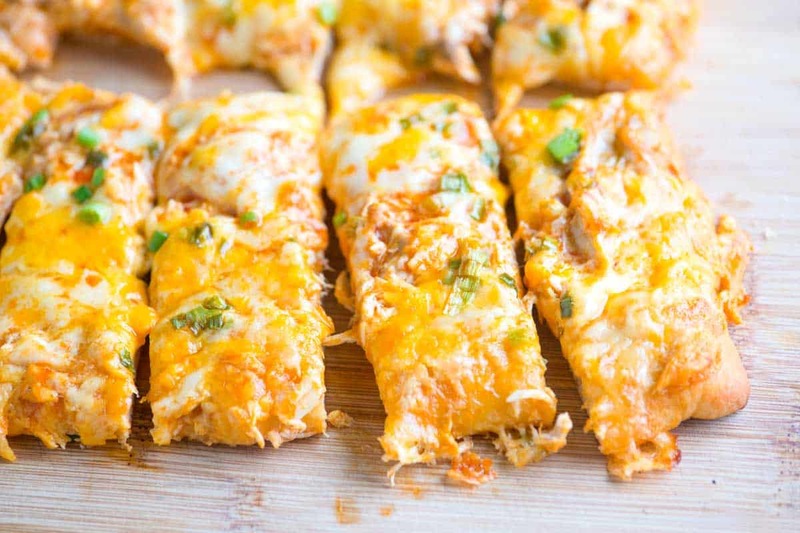 Jump to the Buffalo Chicken Pizza Sticks Recipe. These shells are easy to make and come together quickly. 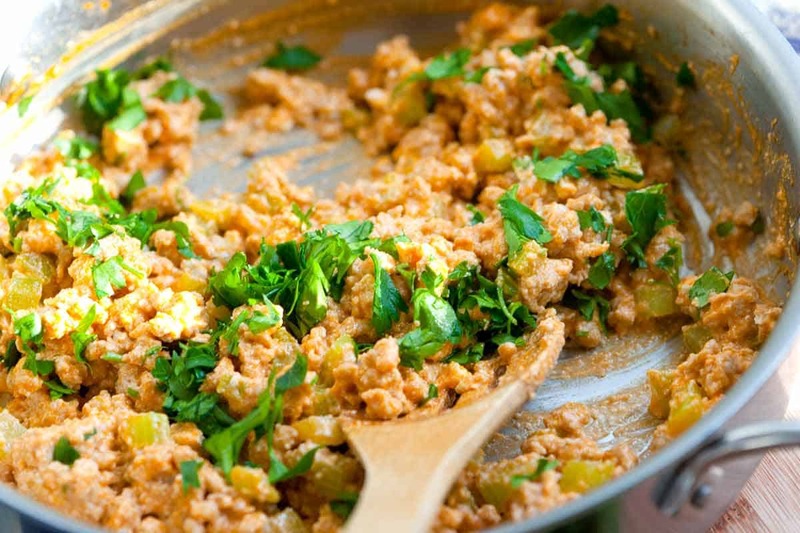 Start by heating a large frying pan over medium-high heat, add some olive oil and the ground chicken (you can also use beef or turkey). Once the chicken has browned, add garlic powder and diced celery. Next add Frank’s hot sauce (or your favorite buffalo style hot sauce). We go for 6 to 7 tablespoons, but it is best to taste as you go until you are happy with the spice level. Stir in some ricotta, blue cheese crumbles and fresh parsley. Fill up the pasta shells and bake until the tips are beginning to brown. 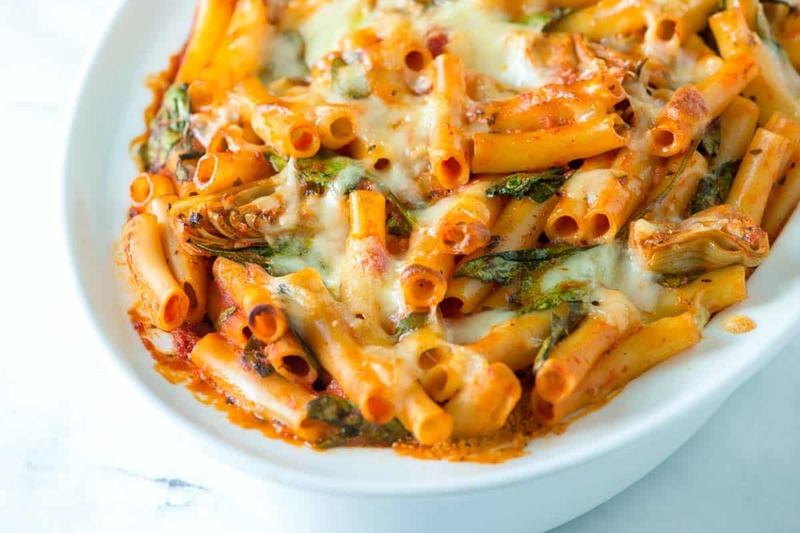 YOU MAY ALSO LIKE: Quick and easy baked ziti recipe with fresh spinach, artichokes, and a creamy pesto layer. 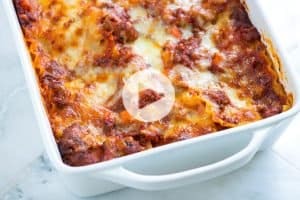 Jump to the Easy Baked Ziti Recipe. These stuffed shells are perfect for dinner, but make the perfect appetizer when watching the game. The stuffing is not very gooey, so you can easily pick up a shell with your fingers and take a bite without mess. When making stuffed shells, add a few more dried pasta shells to the water than you will need since some will rip. The filling for this recipe should fill about 16 shells. Heat the oven to 350 degrees F. Butter a 3-quart baking dish or spray with non-stick cooking spray. Bring a large pot of salted water to the boil, add the pasta shells then follow package directions for cooking the shells. Drain, and then rinse the shells with cold water. Meanwhile, heat olive oil a wide skillet over medium-high heat. 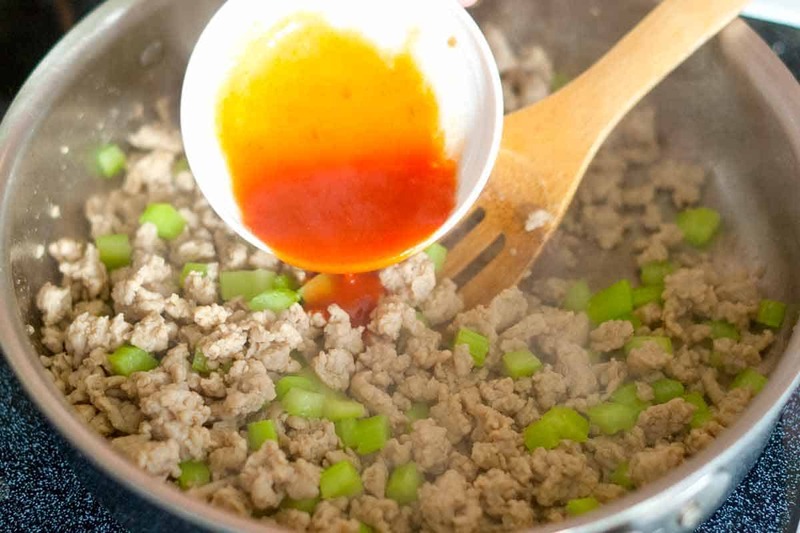 Add the ground chicken and cook until browned, about 10 minutes. As the chicken cooks, use a wooden spoon to break the chicken up into small pieces in the pan. Stir in the garlic powder and celery then season with about 1/4 teaspoon of salt and a few grinds of black pepper. Take the pan off of the heat then stir in hot sauce, ricotta cheese, blue cheese, and parsley. (If you are sensitive to spicy food, it is a good idea to add about half of the hot sauce, taste, and then add more from there). Fill each shell with buffalo chicken filling and arrange into the baking dish. Scatter blue cheese on top. Bake until the tips of the shells begin to brown, about 25 minutes. 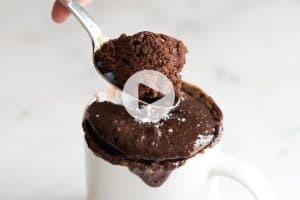 The filling can be made in advance and should last in your refrigerator up to 3 days and in your freezer for about 3 months. We recommend using freezer-safe glass containers, or double layers of freezer bags. To thaw, leave it overnight in the refrigerator. Baked shells freeze well. Let them cool completely on a rack before freezing, and then wrap it well with foil (we use two layers). Defrost the frozen shells overnight in the refrigerator and then bake at 350 degrees F for about 30 minutes or until heated through. Filled and unbaked shells can be made up to 1 day in advance. Cover the unbaked stuffed shells with foil then bake the next day in a 350 degree F oven. These shells have become a staple in my household. 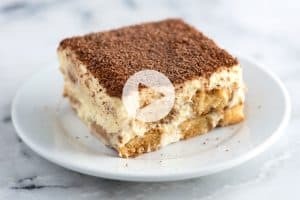 My husband and I just love this recipe, I tend to double it so I can freeze some for easy cooking later on. I have told many family members about this recipe also. What a great dish! Hi! I’ve made these before and served them right away. I was wondering if you know whether or not these would freeze well? Looking to make some different stuffed shell recipes to place in the freezer and use up some ricotta cheese my boyfriend made. Thank you! This is a great dish, and I love this site! 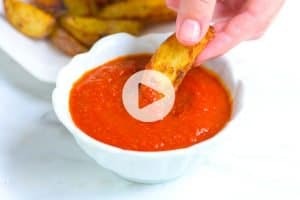 I like your format and instructions plus there are a lot of your recipes that I want to try! I forgot to give you the 5 stars for this dish! My boyfriend refuses to eat anything green or leafy. But he absolutely LOVES buffalo chicken. Could I omit the parsley or use a spice in its place? Or should I just try to hide it? Removing the parsley should work just fine. We’ve made this twice now- once with ground turkey, once with shredded chicken cooked in the crock pot. Both have been amazing. We also toss in about a teaspoon of Tony Chachere’s cajun spice for a little extra kick. Any suggestions as to something else to go with this? Or is the shells enough? A salad or steamed veggies on the side would be great. The shells are pretty substantial, so anything light would work well. No sauce? They don’t dry out while baking? Hi Heather, the tips of the shells do, but we like that. It adds just a little crunch. The filling stays moist. Love it when someone else asks the same question I am thinking! Will be giving these a try tonight. This sounds SO good, as do the other stuffed shell recipes. So glad I found you guys! This looks amazing! the only thing is we are not big blue cheese fans….Can i leave it out or sub with some ranch? Wow! My family is going to love these! Thank you! Your instructions aren’t specific on when to add hot sauce. Thank you! It is fixed now! Add with the ricotta cheese. These stuffed shells look so tasty as well! I just need to make this. As in: now! Looks so good, love this idea! YUM! I’ve never done a Buffalo take on pasta shells. This looks great, especially with the blue cheese. Oh wow. Anything with buffalo has my name written all over it. I just bought jumbo shells at the store today too 🙂 what perfect timing! I am there! Anything “buffalo” flavored and I am down!